Call now at 9560090081 to buy office space in Noida. 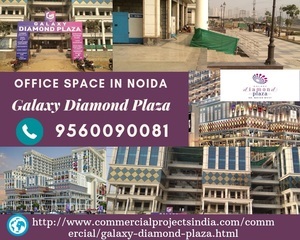 Galaxy group is now coming with new commercial project Galaxy Diamond Plaza which is situated at Gaur Chowk in Greater Noida West. Infrastructure has been designed by famous architects and best interior designers. The commercial space, retail shops & office spaces are available in different sizes. Galaxy Diamond Plaza is connected to DND Flyway, FNG Expressway, NH-24, Yamuna Expressway, and NH-91. Major residential projects are nearest to commercial projects which connected to metro stations in Noida. Galaxy Diamond Plaza the commercial property is built using the principles of Vastu and Feng Shui.